So begins Teresa Bejan’s introduction to this forum on her new book, Mere Civility: Disagreement and the Limits of Toleration. Her important and timely new text explores, as she puts it, “our contemporary crisis of civility” by examining seventeenth-century debates about religious toleration. What still resonates from those early conversations? Whose theories can hold up in our modern day reality? By exploring the resonances between debates around civility and toleration, is there something new to learn? 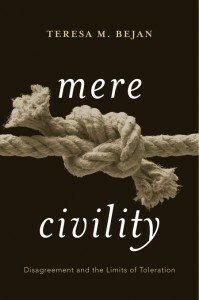 In this series, scholars from various fields engage with Mere Civility, exploring these questions and more. To continue reading the introduction to the series, click here. Or, find other responses below.